Edge of Tomorrow (2014) Tom Cruise at His . . . Weakest? Why did I even bother watching Edge of Tomorrow? I had a feeling I wouldn’t like it and I was right. The story as such isn’t bad, though. A US military officer, Tom Cruise, is brought to London to help in a war against aliens. He clashes with the British commanding officer and while he didn’t want to go into combat, as he’s inexperienced, he wakes up, handcuffed, ready to be shipped to occupied France to fight a powerful enemy. The first episodes are a mix of comedy and action and that’s why I started disliking the movie from the beginning. I’m not sure there really was a need to play it like this. It set the tone wrong as, ultimately, this isn’t another Tropic Thunder and, in spite of the initial groundhog day feel, it would have worked better if it had been darker. Our officer is shipped to France, in spite of his protests, and finds himself battling the enemy in heavy armour and gear. Next to him on the battle field is the war hero Angel of Verdun (Emily Blunt), a highly trained fighter. She’s killed while he shoots one of the aliens. And then he wakes up handcuffed again and the story seems to start from scratch. Since I like some military sci-fi, I think I might have liked this, if there hadn’t been any comedic acting at all. Was that Tom Cruise’s choice, I wonder? It think it’s too bad because when you subtract that you have an action-packed, edgy, dark sci-fi adventure with a great finale. I liked that it used imagery and battles of former wars – Verdun – D-Day landing etc. That gave it an almost creepy, and certainly chilling element. 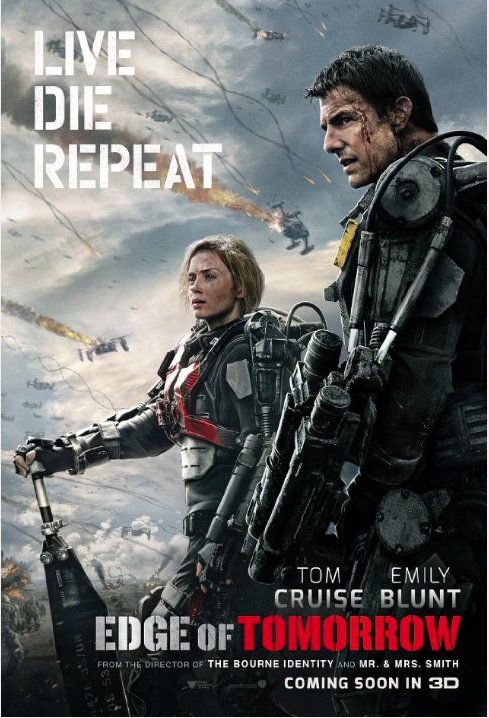 The Edge of Tomorrow isn’t bad, it’s just not consistent. The mood’s a huge mess, in my opinion. It should have been consistently dark. It’s still watchable but not Tom Cruise’s best performance. I’d even say it was the weakest I’ve ever seen. At least Emily Blunt’s surprisingly at home in this role. Nonetheless, if you like action-packed Sci-Fi, you might enjoy it. The trailer is one of those that makes you expect a very different movie. 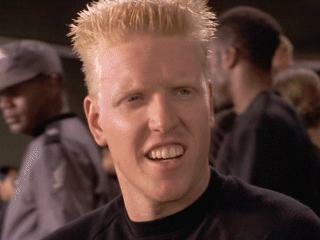 Starship Troopers? Thanks, But No Thanks! Some of you who follow this blog know that I’m making an attempt at covering a whole wide range of war movies, including different sub genres and movies which are not “real” war movies but movies set in times of war. One sub genre I only brushed so far is the Sci-Fi war movie. I did a post on Battlestar Galactica a while back but that’s about it. 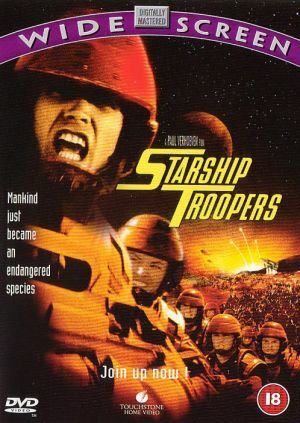 Starship Troopers is one of the movies of the sub genre which is included in many books, analyzed thoroughly and deemed worthy to be seen by many experts. Now that I have suffered through half of it I really wonder, what the heck this movie was meant to be? A parody? A satire? An advert for dental floss – there is a lot of white teeth flashing at the camera going on in this movie, believe me – ? I tried. I failed. I don’t think I will ever be able to finish watching this movie. Have I learned something? Yes. I hate movies which remind me of tooth paste adverts. For those of you who are still interested, here’s the trailer. Maybe I’m missing something here. Feel free to enlighten me.